A town centre with retail outlets a supermarket and industrial area. One of two main entrances from Dux Court Road. The whole development will sit in the valley that runs westward from Dux Court Road up to and including Chattenden village. You wont be able to see it from the bypass but it will be visible from Dux Court Road and High Halstow. There will be two main connections into the development, one at the western end at the top of Four Elms Hill and one at the eastern end onto Dux Court Road. No other entrances are proposed. It is proposed that Lodge Hill will be linked to the Medway Town and its communication links by a “fast-track “ transport system, which may incorporate Hoo. Linking the other villages on the peninsula would make journey times un-acceptable instead it is likely that the existing busses will run into Lodge Hill forming a hub for onward Journeys. The Developers are currently in consultation with Natural England to minimize the impact on the ecologically sensitive areas that surround the site and the wider North Kent Marshes with their Special protection Areas so fundamental in recent times with proposals for an estuary airport. It is extremely important that we as a community involve ourselves in the ongoing process so that we can achieve the very best for the present and future residents of High Halstow. I very much hope that Land Securities will be able to attend our Parish Annual Meeting in April where they will be able to expand on their proposals and the impact they will have on High Halstow. If you have comments or concerns and are unable to attend the meeting please let me know as soon as possible that your view can be properly represented. The transport strategy has not yet been finalised, but the Lodge Hill transport consultants (along with Medway Council and the Highways Agency) are looking at two accesses into Lodge Hill. Firstly, a new access off the A228 (Four Elms Hill) into the southern section of the site. This access road is approximately located where the current layby is on Four Elms Hill. There is the potential for a secondary access further up the A228 and using Dux Court Road. This will require upgrading of Dux Court Road to the point at which it enters Lodge Hill (somewhere in the vicinity of the Deangate sport ground). The remainder of Dux Court Road will not be changed, so it will retain its rural nature. We’re conscious of the need to avoid ratrunning through surrounding villages and measures to stop this are being considered. At the same time we would want surrounding villages to be able to access into Lodge Hill (if they so wished), so a balance has to be struck. 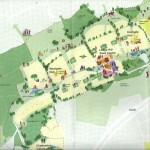 The RSPB have are objecting to the lodge hill development in its present form. No increase in road capacity on the A228 already reaching full capacity. Traffic lights at Four Elms roundabout is that really the answer to the extra traffic? Where are the jobs to serve these people or are they too going to join the list of commuters on the over crowded road and rail networks travelling to London? Like any thing else this development is only waiting for the market to be right. The demand for new housing is high and as been rising for some time. Lodge Hill will happen!! perhaps not all at once but it will happen. I’m sure the people of Chattenden and High Halstow don’t realise that planners are proposing only two access to Lodge Hill, Both onto the A228, one through the village of Chattenden to the top of Four Elms Hill the other utilising DUX Court road in High Halstow. A TOWN LARGER THAN HOO with Industrial units, schools, hotels, dedicated buses extending Medway’s urban sprawl right on our door step. !! to operate business from them? .. bugger all! My main concern is how your proposed development will impact on the community of High Halstow in particular the types of dwellings you propose the mix of social housing and the access to High Halstow those residents will have. What proposals you have in place for access to and from the site to the nearby north kent relief road and the A2 beyond. Have you considered what impact a new development of this size will have on the social amenities in the surrounding villages and whether you could fund the improvement of surrounding local amenities at the same time as development progresses. So that Lodge hill is not seen as an attraction drawing people away from established local community facilities. Please find attached the three public consultation reports. These are also available to download from the Lodge Hill website and we issue hard copies to anyone who wants one. I’m just finalising the report from our most recent series of public exhibitions at the end of last year, and I will forward a copy of this to you once it’s finished. On of the exhibitions was at High Halstow village hall and 21 people attended this. You raise a number of questions in your email, which I have attempted to answer below. We’re always happy to come and meet with people if they would like more detailed discussions. The current plans for Lodge Hill will provide circa 4,500 – 5,000 homes, which will range from starter apartments through to family houses. To give you an idea of the mix of new homes, we’re probably looking at 20% of that number being apartments, 25% terraced homes, 35% semi-detached and 20% detached homes. There is a bias towards detached and semi-detached homes to try and rebalance Medway’s current housing stock, which has less than half the national average of detached housing. There will be a percentage of affordable housing, which will be in line with Medway Council’s policy on this. Lodge Hill has the potential to provide a range of community facilities to new and existing residents. 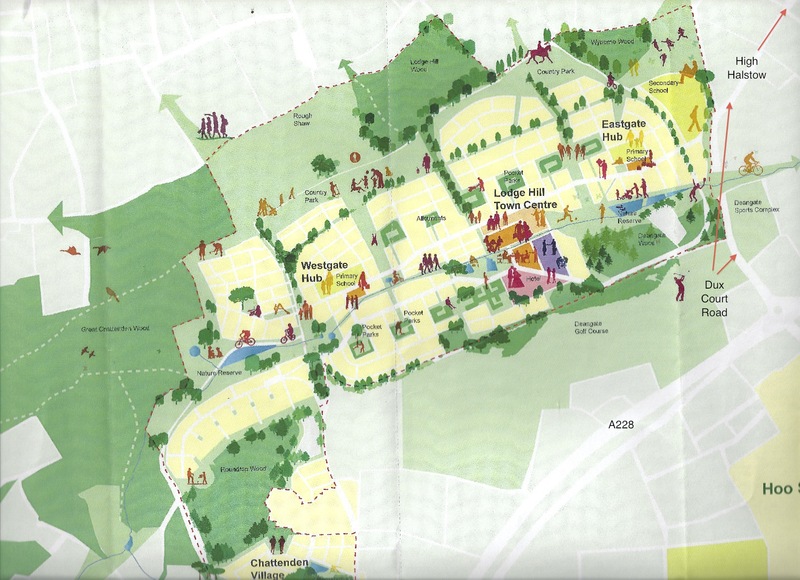 The plans encompass; primary schools, a new secondary school, health facilities, sports provision, community centres, restaurants, cafes, shops, supermarket, hotels, places of worship, garden centre, equestrian centre, retirement village, youth centres and a nursing home, as well as many acres of parkland. People from surrounding communities may wish to use these new facilities and conversely, the new Lodge Hill residents may wish to use the social amenities in other villages if they’re not available at Lodge Hill, such as joining the High Halstow cricket team. We need to provide people with the facilities they want and need, without detracting from the amenities already on offer. If you have any further questions, or wish to clarify anything, please drop me an email or call me on 0845 683 2544. Your comment re transport and facilities are the most worrying for our village. It would seem that the Dux Court entrance would be the second of only two entrances to the site for potentially 10 to12000 (5000 x 2.5 ish) people and with a secondary school planned for that end of town a rat run would be the very least of our problems. I am worried that new facilities just down the road from us will attract people away from the village to socialise and take part in community activities rendering the village devoid of its soul, after all most people here have chosen to live in a small relatively isolated village. We have asked your team to present to us at our May AGM but i now understand you have nothing available until June.I trust if this is the date set then we will have time to have our feeling and comments heard before you go to planning. Thanks for put this article up so quickly. I have contacted Rowena Collins of PPS and asked a couple of questions.. she has not responded as yet. I met with Caroline Allen from Medway this afternoon She has given me the relevant pages from the Pre Publication Draft Core Strategy to look through to perhaps get a bit more insight into the impact for the village. I know that there are a few Hoo residents not happy with the traffic situation, its pretty congested at peak time now so its going to be madness in a few years time. perhaps even soon if construction starts in 2012.